A.R.T. 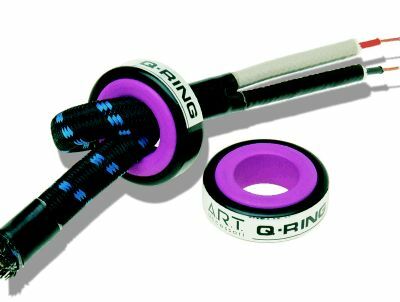 Q-RING is a special ferrite ring with the addition of insulating materials, capable of achieving considerable reduction of the interferences and disturbances caused by ultra high frequencies and electromagnetic waves (DIGITAL PULSES AND MAGNETIC PULSES). The former are generated above all by the digital circuitry of CD players and converters; the latter by the transformers, capacitors and diodes found in many types of equipment. These disturbances are not always measurable, often being so weak as to seem negligible. But the PVC sheath which normally protects all types of cables (power cords, signal cables and speaker wires) can make them into true antennas, capable of picking up even the weakest emanations.And these can travel along the cable surfaces from one component to another of the system, causing interference with the electronic components, provoking disturbances and seriously deteriorating the signal. A.R.T. Q-RING works like a small isolation transformer, and it is without doubt the most economical system available for screening and absorbing these types of interferences and blocking their transmission along cables.